The Loft Literary Center announced the festival which is slated for May 11 and May 12. High-profile, award-winning authors attending the festival include Stephen King, Jamaica Kincaid and Amy Tan, as well as locally-based literary titans such as Marlon James and Nora McInerny. The festival will take place in Minneapolis’ Mill City neighborhood, running from 10 a.m. to 5 p.m. each day. On the night of May 11, there’ll also be a “Lit Crawl” around Uptown’s Lyn-Lake area. The street festival will be free for kids 17 and younger. Die-hard Stephen King fans can also buy tickets to see him perform with his band, the Rock Bottom Remainders, which features several other festival authors, at Minneapolis’ iconic First Avenue. The concert is slated for May 10. Tickets will go for $40. For more information on the festival, including a full list of attending authors, click HERE. 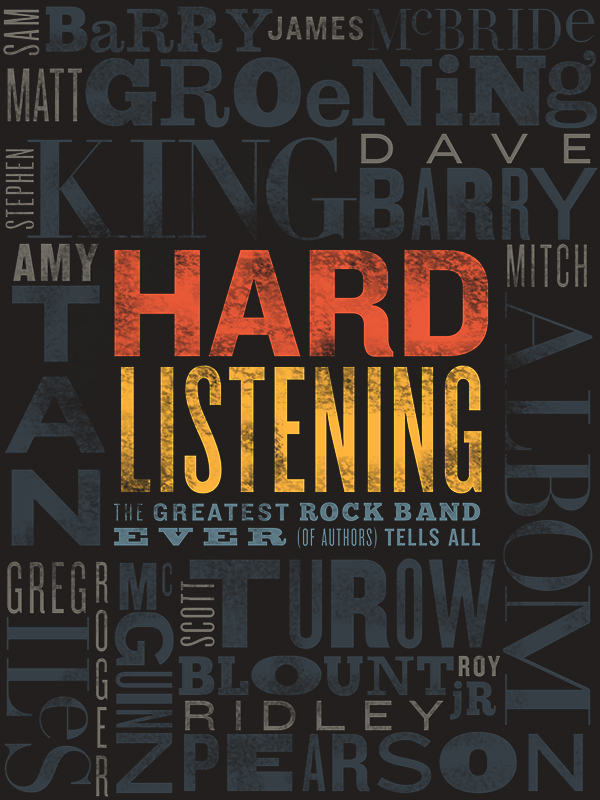 Hard Listening is an interactive eBook that will be digitally published by Coliloquy about the band, The Rock Bottom Remainders. “Over 350M books sold. 40 New York Times #1 Bestsellers. One lousy band. In 1992, a cadre of the world’s bestselling authors formed a rock band. Twenty years later, they’re hanging up their guitar picks, drumsticks and leather whips, but not without a look back on two decades of friendship, love, writing and the redemptive power of rock’n’roll. Hard Listening is a voyeuristic view into the private lives of your favorite authors, combining essays, fiction, candid email conversations, Q&As and interactive parlor games. Stephen King contributed a new essay, a new short story, and several candid email exchanges to the book. The essay is called ‘Just a Little Talent’. King’s fans will also enjoy the writing contest in which several of the authors (including SK) contributed short stories written in Stephen’s style. The 4 stories are ‘Robert Johnson’s Flattop,’ ‘The Rock and Roll Dead Zone,’ ‘In the Woods,’ and ‘Black Mambo’. Readers then get to vote on which piece was actually written by Stephen, before seeing the results.